Sounds of Britain - Europa Cultural Diversity - Great Britain stamps 3 October 2006 - from Norvic Philatelics. The 2006 Europa series has the theme 'Cultural Diversity' with particular emphasis on youth. 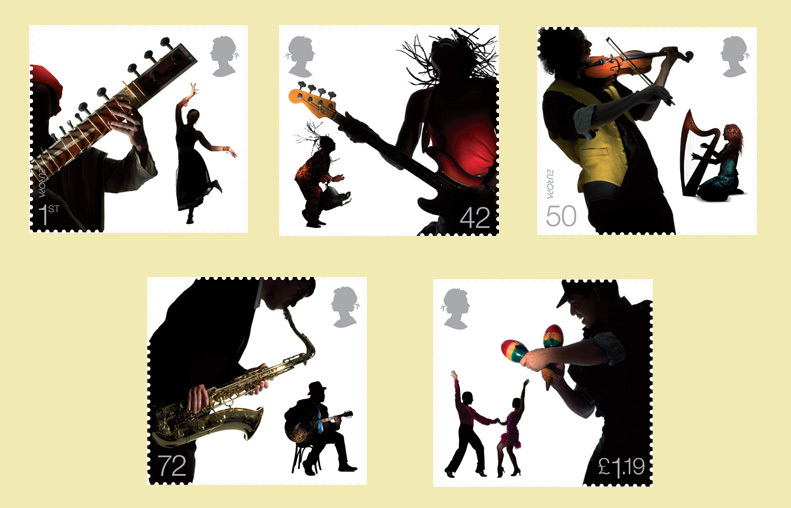 Royal Mail have chosen a musical aspect for this theme, entitling their set 'Sounds of Britain'. The UK has long been a melting pot for musical ideas, ranging from jazz brought to Britain by American servicemen during the war and the music of immigrants from Africa, the Caribbean and India. British musicians have taken these influences, modified them and put them together again to create their own sounds. 1st class - Asian, Sitar. "Bollywood and Bhangra"
42p - Caribbean, Bass guitar. "Africa and the Caribbean"
50p - Irish, Fiddle. "Celtic"
72p - Black American, Blues*. "Jazz and Blues"
[44p] £1.19 - Latin America, Maracas. Designed by CDT, the stamps are printed in lithography by Cartor Security Printing, size 37x35mm with PVA gum, in sheets of 25 and 50. 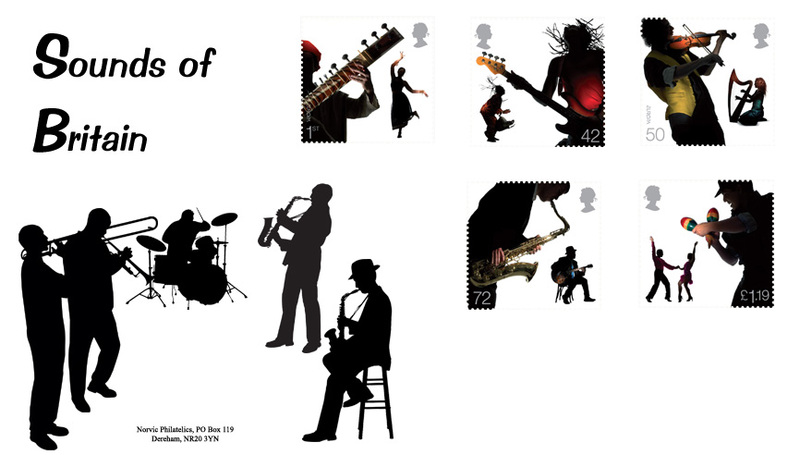 All images except our FDC are Copyright 2006 by Royal Mail. Our exclusive limited edition cover for this issue is shown below (preliminary design) - Price £8.95. Some special postmarks announced for the Day of Issue are shown here (not to scale). Others will be added in due course. L10222 - CDT Design - designers of the stamps.